GAIN, in Bangladesh, is supporting the formulationof a National School Feeding Policy with Ministry of Primary and Mass Education (MoPME) and Planning Commission of Bangladesh. 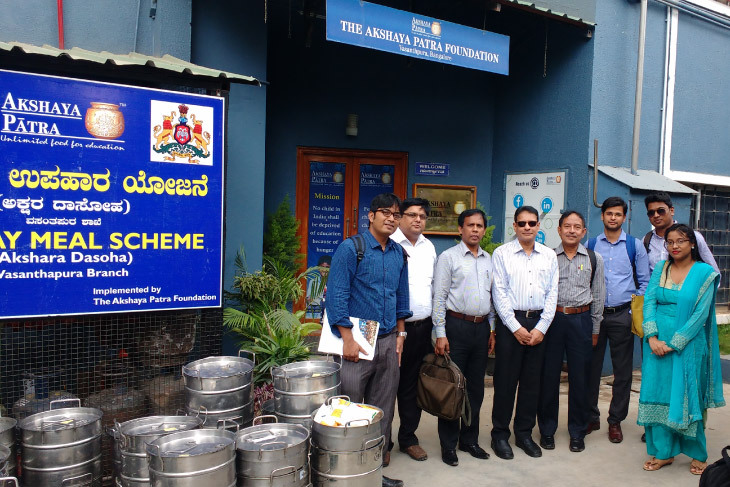 The team thought that Akshaya Patra is a good model to study the successful implementation of the Mid-Day Meal Scheme in a public-private partnership and that they can incorporate valuable inputs which can be replicated in Bangladesh. The visit included interactions with Shridhar Venkat – CEO, The Akshaya Patra Foundation and HODs (Head of the Department). During their visit the delegates observed kitchen operations and also interacted with beneficiary children of the Foundation and spoke to the school administration about the Mid-Day Meal Programme. Later, the team met government officials, including Joint Director – Mid-Day Meal Scheme, Bengaluru and Director – Mid-Day Meal Scheme, Lucknow, for a detailed understanding of the scheme.